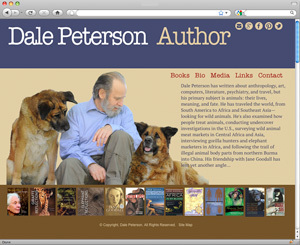 Dale Peterson has traveled widely among wild apes and elephants, scientists and pygmy hunters. He is an adventurer of a rare sort: he is brave, thoughtful, kind, smart and an old-school gentlemen who is a wonderful listener. That’s why his books are so good. He’s as fine a writer as he is a thinker. His coming book, due out in March, is The Moral Lives Of Animals. I read it in manuscript; I consider it one of the most powerful books and important books of this decade. Brenda Peterson is a dear friend (unrelated to Dale) whose celebrated work I came to know thanks to dolphins. Her latest book, I Want To Be Left Behind, is a loving memoir of an Earth-loving free-thinker growing up in a fundamentalist Christian family. It’s full of drama, humor, affection, wisdom—and even some good recipes! 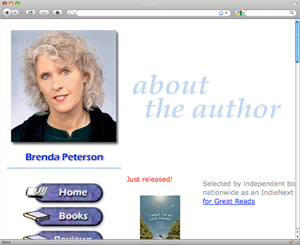 This spring, when both of us had new books out, Brenda and I toured bookstores together and spoke at the Burke museum near her home in Seattle. She lives on the beautiful Salish Sea, where she observes and protects baby seals. 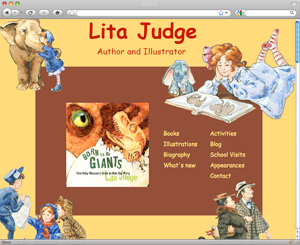 Lita Judge is a friend and neighbor (living over the next town, in Peterborough) who writes and illustrates children’s picture books with great originality and energy. Her child-friendly, welcoming drawings of everything from birds to dinosaurs are meticulously researched. She manages to both write and paint with equal parts playful whimsy and scientific integrity. 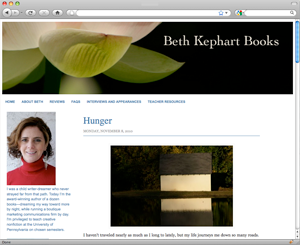 Beth Kephart is an exquisite writer whose books—for both “regular” adults and “young” adults—should be savored by everyone who loves vivid writing. A Slant Of Sun, her memoir of raising her son, was a finalist for a National Book Award. Read Beth’s prose sitting down. Her sentences are that dazzling. 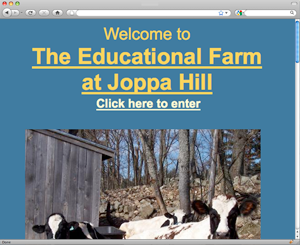 The Educational Farm is at Joppa Hill, a beautiful farm and sanctuary in Bedford, NH. Founded to increase public awareness of open space, sustainable agriculture and the environment on a working farm, it’s also home to another friend of mine, China—a pig who was discovered living in a closet at a Chinese restaurant! Like Christopher, China will live out her natural life surrounded by friends thanks to Lin’s kindness. There are a number of excellent sanctuaries for pigs in the US—among them Pigs Peace Sanctuary in Washington State; The Pig Preserve in Tennessee; and Ironwood Pig Sanctuary in Arizona. I support them all wholeheartedly! 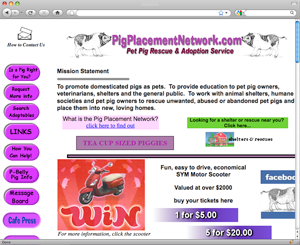 But if you are considering adopting a pig, I’d like to call your attention to Pig Placement Network Pa., which specializes in placing unwanted pigs in loving homes. They’re good folks. 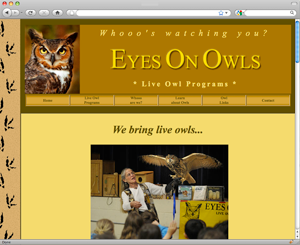 My friends Marcia and Mark Wilson bring wild owls (who they have rehabilitated after injuries, but can’t be set free) to schools, libraries, nature centers and animal lovers anywhere in New England and New York.